My name is Lona Westberg, and I’m a donor and friend of cbm. I am a wife and mother, and have been a strong supporter of cbm’s visionary work for about 4 years. 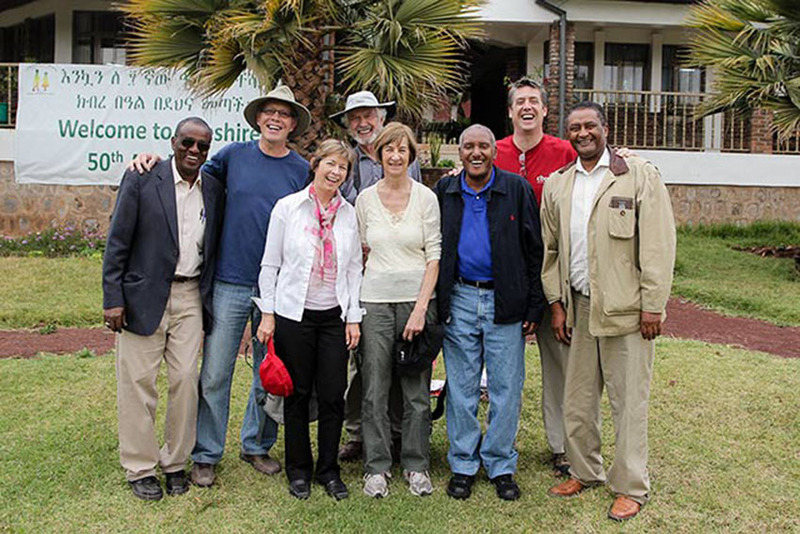 My husband, David, and I had the opportunity to take a trip to Ethiopia in March of 2013 to visit cbm’s projects. I never thought I’d see Africa. My children have travelled and worked there and loved it. But I didn’t think I would ever go, so I was more than excited and thankful to God for the opportunity. Everything we saw was eye-opening. I didn’t realize how many local partners and programs cbm has in Ethiopia – 28 programs in total – and I think there is so much wisdom in that approach. cbm realizes they can’t do everything on their own, so they partner with all these wonderful organizations that are doing their own good work. Together, cbm is able to work with hospitals, schools, physiotherapists, and many others to help build an inclusive community to lift families out of poverty. 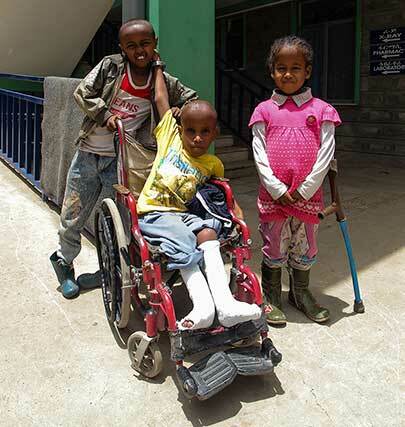 One of their largest partners is Grarbet Hospital, located a couple of hours outside the capital, Addis Ababa. It is a wonderful facility that functions almost like a “one-stop shopping centre” for personal health. They perform eye surgeries, checkups, give medication, do orthopaedic surgeries as well as produce eyeglasses and prosthetics. It really is an incredible facility that can care for most of a family’s medical needs in one place. The strategy of partnering makes cbm’s work so much more effective. 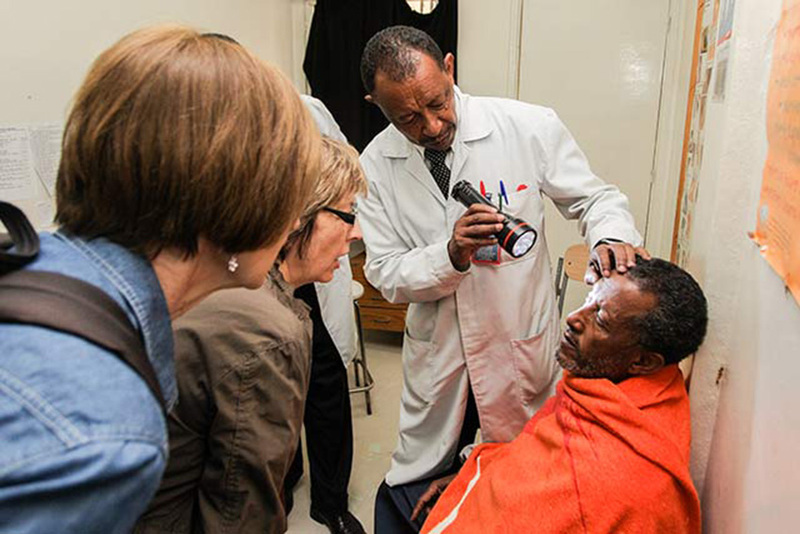 Dr. Solomon examines a patient who received cataract surgery at Alert Hospital. For example, another cbm partner is Alert hospital, which has a wonderful dedication to eye care. If a child who is blind comes to Alert, but his or her sight can’t be restored, the hospital staff refers that child to the Addis Hiwot Center of the Blind, another one of cbm’s partners. Students learning to read and write Braille at the Addis Hiwot CeNter of the Blind. The Hiwot Center of the Blind is dedicated to teaching kids who are permanently blind and equipping them with the skills they’ll need to live a full life. Not only do the staff work hard to give these kids access to an education, but they strive to make it first rate. Many of their students have only recently become blind and the teachers didn’t want them to fall behind in their studies. So the staff have recorded a number of audio books so students can follow along with their lessons even as they start learning how to read Braille. Another thing worth noting is that Grarbet Hospital’s patients and its surrounding community had access to clean drinking water. That is because cbm is involved with another partner – working to install clean water wells throughout the country. It’s not good enough just to cure a child’s sight. Fekede, a visually-impaired student at an inclusive cbm partner school, shows me his latest artwork. He creates his pictures by sticking pins into a flat surface. Then he uses his hands to feel out the shape. Everything cbm does is about treating the whole person. It’s not good enough just to cure a child’s sight – they want to make sure that child will get an education, have clean water, and be protected from future infections and disability. There was one little boy at CURE Hospital (a partner project that treats children with disabilities) who made me so grateful for this strategic approach. When I first saw Yeabsira, he was zooming towards me in his wheelchair and raising his arm in the traditional Ethiopian greeting. He had these bright round eyes and a big smile. He wanted to know my name and who we were. I could see the face of God in this precious little boy. Yeabsira was hydrocephalic. Fluid around his brain had caused his head to swell. Both his feet were in casts to correct his clubfeet. He inspired me with his generous heart that seemed to be filled with hope. I could see the face of God in this precious little boy. God’s love seemed to flow from Yeabsira’s heart. The kindness and the interest he showed to all of us – that stuck with me. There was so much more to this little boy than the way he looked and problems he’d been born with. And that truth has stayed with me to this day, because it was a lesson I needed to learn. Yeabsira and his hospital buddies outside CURE Hospital. Today Yeabsira is still in my prayers, and I take comfort in knowing that Jesus is watching over him. I can also take comfort in knowing the solution-driven strategy cbm has in Ethiopia will continue to support Yeabsira. I know he won’t just receive surgery and be left on his own. Instead there’ll be so many cbm partners there to help him in his journey whether that’s through clean water wells, physiotherapy specialists or inclusive schools. cbm works to help the whole person. After seeing their work first-hand, my husband and I are prayerfully considering leaving a gift to cbm in our Will. And we invite others to do the same. Me (holding the red hat), David (behind me in the blue t-shirt) and our team. Truly enjoying our experience in Ethiopia with cbm. Because of what I’ve seen first-hand, I can promise that a gift in your Will to cbm will change lives. Because of what I’ve seen first-hand, I can promise that a gift in your Will to cbm will change lives. Whether your gift is big or small, you’ll help build communities and restore ability to the poorest of the poor. If you’d like to talk more about this, please give Grace Soukup a call. She is cbm’s Manager of Planned Giving and you can reach her by email at gsoukup@cbmcanada.org or phone at 1-800-567-2264, ext 288. Hear Lona and her husband David tell their inspiring story in our “A Legacy of Love” DVD. Order your FREE DVD now .